High School is an exciting time in your sons life. 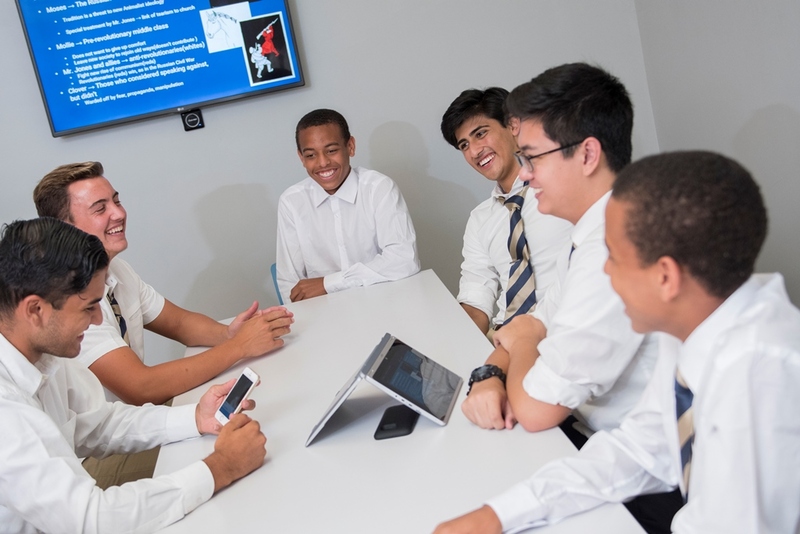 We know that selecting the best possible school for your son is an important process, and St. John Bosco's Admissions team is committed to helping you and your family through each and every step while making your family’s experience as individualized, relaxed and personal as possible. To help all of us make the determination, we have designed an admission process that is informative, comprehensive and, we hope, hassle-free. Each applicant to Bosco has full access to our admissions team who will guide you through the process, and you should feel free to contact them any time you have a question. As part of the admission process, we will request information about past and present academic performance and personal interest. 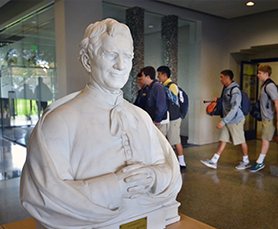 You will be asked to visit campus and participate in an interview with a St. John Bosco Faculty or Staff member, and you will be asked to submit scores from a standardized test. If you would like more information about St. John Bosco High School before applying, you can fill out an inquiry form or call the admissions office at (562) 920-1734 ext. 313 or emailing us at admissions@bosco.org. We go out of our way to make the admission process enjoyable for prospective students and their families. The best way to find out if you could be a Brave is to come and see for yourself! Spend the day at Bosco as a honorary Brave for the Day - we will partner you with a student ambassador who will be your tour guide throughout the day. You will get a behind the scenes experience as you attend classes, eat lunch on campus and experience the Brotherhood in person. How do I arrange a Brave for a Day visit? Does St. John Bosco offer scholarships? Is there any sort of tuition assistance available? How much tuition assistance may I expect to receive? Does St. John Bosco High School Offer Transportation? You can schedule a Brave for a Day visit by filling out an online inquiry form or call our Admissions office at (562) 920-1734 ext. 313 to schedule an appointment. Each year, Bosco offers need-based tuition assistance to make its educational experience accessible to qualified students, regardless of their socio-economic background. No. A finacial award is used to offset the cost of your child's education.